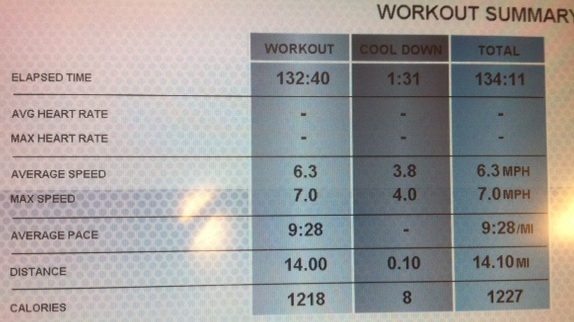 Today’s workout 14 miles, much too long at a too slow pace on a treadmill. To be fair, it was on an incline of 2-3 with a short phone call break not a good excuse but I can whimper. 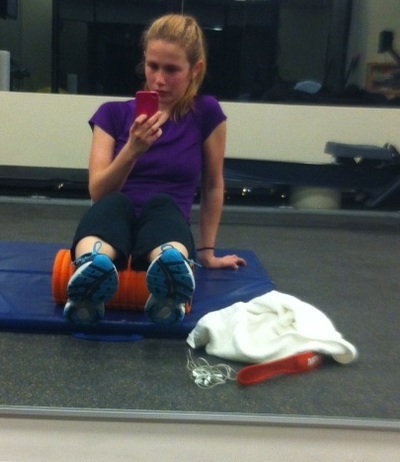 So how do I survive a long(ish) boring treadmill run after a long work day? Yes 14 miles is long for as before last two months my regular routine was just 5.5 miles on a treadmill at a time with a painful long run of 7 miles. It takes a full eating day, because if I don’t eat well, I don’t last beyond 7 miles maybe 8. I guess I can try to integrate Gu but just writing makes my insides curl up for now. I carbo-load for breakfast. 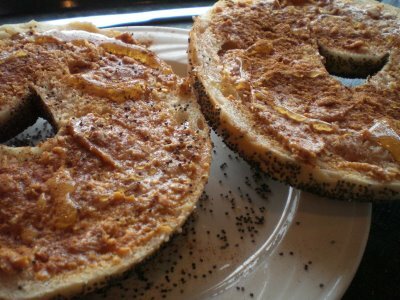 Giant sesame seed bagel smothered in peanut butter with extra salt from my amazing work cafe. This picture is stolen as I ate mine before I decided I’m going to blog about what I ingest into my belly. My bagel is bigger with a lot more peanut butter and 3 salt packets. I usually leave 1/4 of the massive bagel to nimble on later. I skip my regular lunch break/workoutB to catch up on work so I can go up to the gym a little before 530. Most importantly I usually grab lunch from cafe as its all you can grab for 6 bucks and I found out that when I try to run post work on my regular from home lunch I burn out quicker. 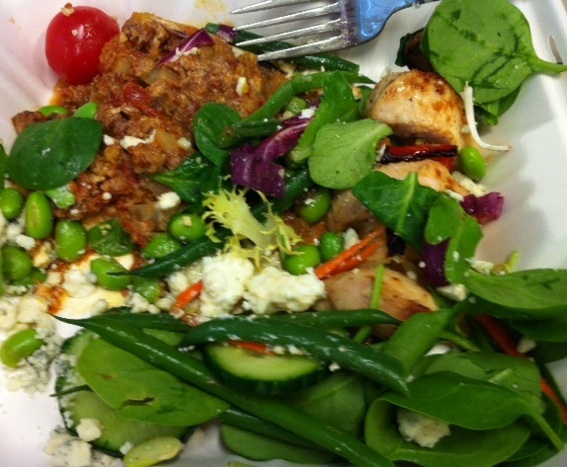 Although my work lunch is very fairly priced for the balanced options on the days I don’t run long(ish) I still make my own as the work cafe makes it way too easy to overindulge. So here’s part one of what I grabbed. 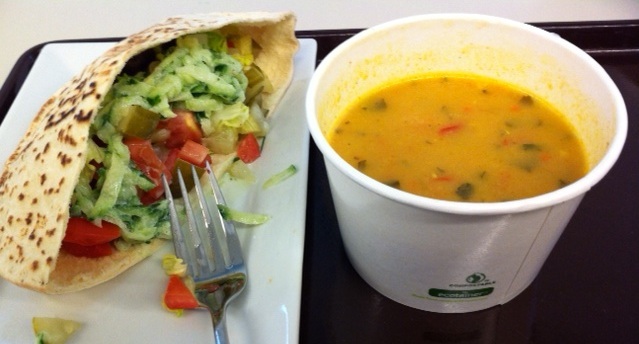 A gyro sandwich and coconut curry soup. I ate half the soup and put the gyro on the side because I had my eyes set on the next part of my meal. 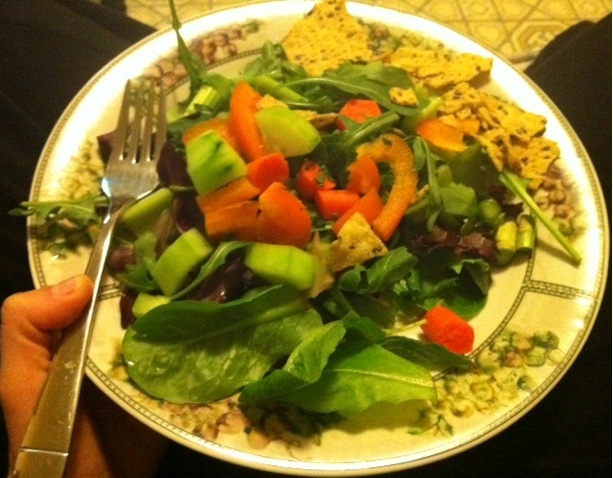 My baby spinach salad. 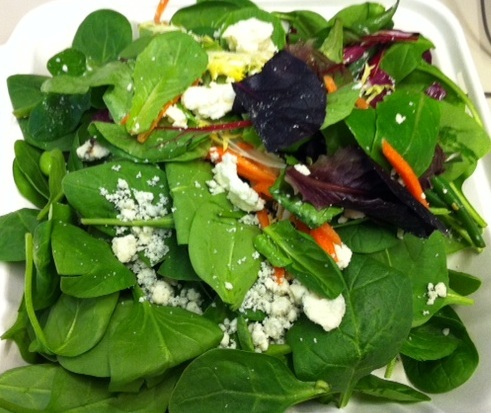 Did I mention I’m a baby spinach addict like Popeye! He had to get strong and so do I. I love the sweet taste of baby leaves compared to bitterness of a spring salad or plainness of romaine. Yes I might have went crazy with adding goat cheese and feta cheese. B Not sure where this lately crazy cheese craving came from. Yup, I really load up those to go container, cafe staff and my bosses must think I’m feeding a third world country underneath my desk. 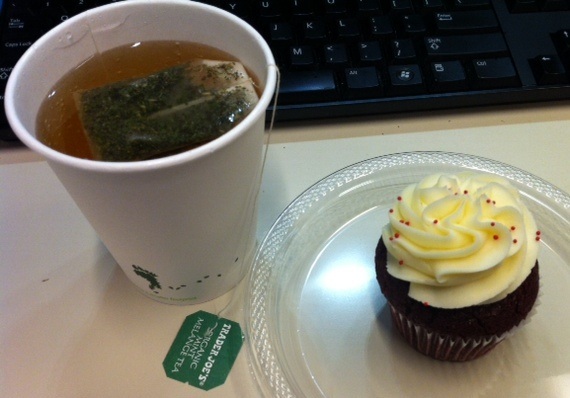 Around 3pm, one of my amazing coworkers got us some cupcakes from the South End Buttery. B This awesomeness is created with a “traditional Southern recipe, made with cocoa powder and aB hint of vinegar, topped with cream cheese frosting.” Did I mention this is the first time I liked frosting on a cupcake! I had half with a nice cup of mint tea. B I saved the other half for breakfast. B Can’t wait! I’d like to sayB that’sB all I ate, but I did munch on some berries and a pack of peanut M&Ms (250 cals pack). B Yes my teeth will rot, but my coworkers will beB gratefulB because sugar keeps me perky and not the crazy cranky Liana monster that can appear when tried. I fully wrapped up with someB GreekB yogurt and more berries for refuel as it was already 7:30 and I had an hour commute back to my palace aka apartment and I hear passing out on trains never leads to a good night. Dinner was another boring low key salad as I was slightly tired by the time I made it home. B I reheated the other half of my coconut curry soup and ate that gyro from lunch. B Process meat is fine by me as long as its at the end of my day and not the middle =). There might have been some more pretzel sticks as I was making my salad and a few pieces of Trader Joes darkB chocolate with some organic ginger peach tea. Overall, it was a good day through and through. B Hope yours was too! I try to do 1-2 long(ish) runs in this part of my training during the week with one long run on the weekend. B I’m terrified of running outside and I think lack of light leaves me a bit depressed so I stick to indoor post work workouts. B On the downsize I find the treadmill a lot more tiring than the pavement so I try to pay closer attention to what I eat on those days. B It’s my first marathon and I’m a bit on the rush to build up my base from regular 5 mile runs to 26.2.